Remembering good times is an inherent pleasure of our everyday lives. Memories partly fuel our actions, because having lived a happy moment gives as an incentive to repeat it. We love going back to common experiences during our social gatherings, but we also organize said gatherings precisely in order to go back to great instances we lived together. That is probably the meaning of celebrating an anniversary. When it has been a year after a happy event, we want to re-live the fine times and talk about the blessing we felt at the time. 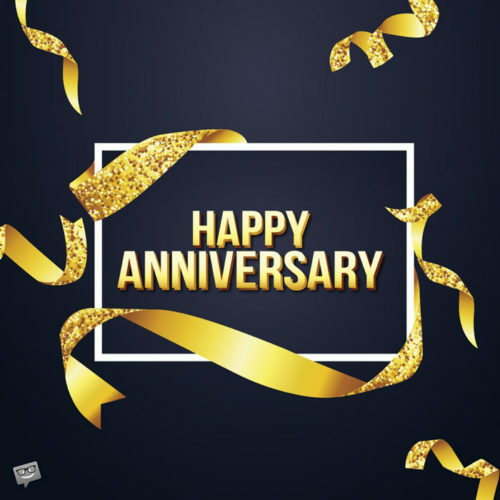 Parties and dinners apart, we thought that words on images can also say it better: our collection of touching “Happy Anniversary” pictures is here to spread the feeling of joy and remind us what fun is. 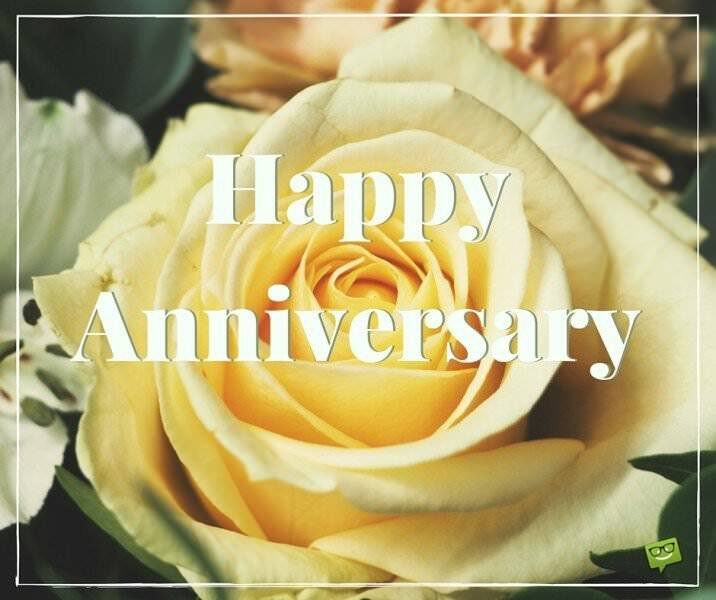 If you want to make an introduction to a special day by sending wishes to your love or whether you know a friendly couple of yours celebrates their anniversary today, share one of our anniversary images and feel the joy. These are wishes and images you can share with your other half for free to express your love and human gratitude for the fact you’re together. You are more than my other half – you are my best friend! I love you babe and happy anniversary. Honey, you know I’m not good with words so I don’t know how else to say this: you rock! Happy anniversary. Cute. Adorable. Intoxicating. Cuddle bug. My other half. The love of my life. Just a few words to describe what you mean to me. Happy anniversary, baby. I love you to the moon and back. You are the light of my life and you complete me. Thanks for another wonderful year of marriage. Happy anniversary. I never knew love until I met you and said “I do”. Happy wedding anniversary, babe. I am so lucky to have married you – you’re my best friend. Happy anniversary. Happy Anniversary. I love you to the moon and back! As I sit hear beside you I’m reminded of why I married you – because you are perfect. Happy anniversary, baby. Each year it gets easier for me to imagine the rest of my life with you. Happy anniversary, angel. Thanks for putting up with me all these years, honey – happy anniversary! I know we are both imperfect, but I think we fit perfectly together, don’t you think? Happy anniversary to my other half. I woke up this morning and thought it was Christmas. Then I remembered it is just our anniversary – this day is just as special! Happy anniversary to a great life companion! Even though you’re my other half, you should know that you hold the key to my whole heart. Happy anniversary. I tried to figure out why I do so many stupid things- I think it’s because I know I can always depend on you. You’re my rock. Thanks for always being there. Happy anniversary. Our love is like the flowers in the sun: it keeps blossoming more beautifully every year. Happy anniversary, sweetheart. Hey honey, thanks for not turning me in. Apparently they call it kidnapping when you take someone and want to keep them all to yourself. Happy wedding anniversary! Before I met you, I wondered around, aimlessly. There was no real meaning or direction in my life. From the moment we met, I knew what my purpose in life was: to love you. Happy Anniversary to my other half, the person who brought meaning into my life! Best wishes to my best friend and the love of my life! On this day, may we rejoice in the fact that our marriage has made both of our lives complete, and may we have many more years of happiness! A heartfelt wish to THE ONE: I hope that I can always bring a smile to your face and show you how much your existence is cherished by me! The day we became one caused the empty space within me to brim with exuberance! May our anniversary be high spirited and memorable! Our anniversary is a chance to remind you that you are above everyone else! Because you enlivened someone who was once dreary, you hold a special, constant place with me! Being married to you has made me whole. The delightful nature in which you approach everything has taught me to do the same, thereby bringing richness to my life! May every anniversary we have convey what you have brought to me, and our relationship! 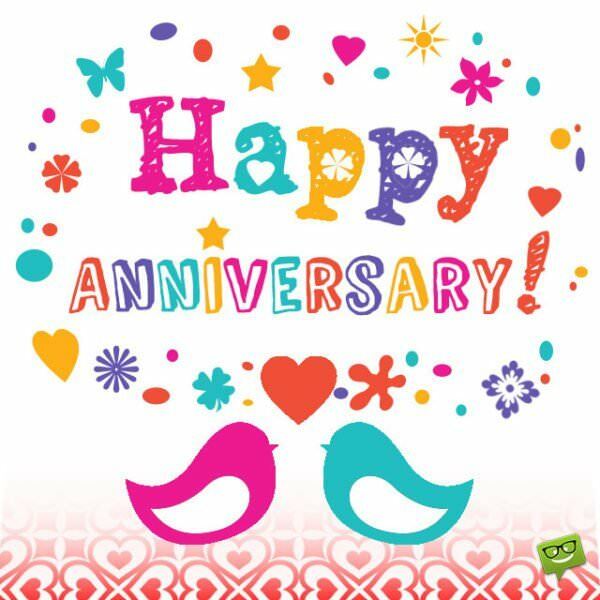 May the event we hold in remembrance of our wedding anniversary be enjoyable and shared with loved ones! May it become a point of reference for all of the events that follow it! Everything that was missing from my life materialized the day that I met you! As we recognize our anniversary, may the privilege that I had of marrying you, be clear! Finding someone who loves to travel to new places has been exciting! Marrying you was the start of a new adventure! May our anniversary be as exhilarating as our lives together have been, so far! Our marriage would not work without your kindness and intelligence! Happy Anniversary to a husband who provides the essential components of our marriage! My dear wife, I hope that you are aware of the impact that you have on me. As the anniversary of our wedding arrives, may the significance of your goodness be apparent! It’s true. When you are with the right person, you just know. Cheers to a husband, who has reminded me of what’s important and promotes certainty! Happy Anniversary, to my courageous husband! Your ability to take the initiative makes me a braver and stronger person! May this jubilant occasion be the precursor for more moments by your side! May we have a thoroughly, enjoyable time! My respect for you is immense! Wife, you are the most capable woman that I know! Your strength and skill move me to reach my accomplishments! I hope that this day of our anniversary allows us to have enough time to achieve our goals, together! Falling in love with you, did not happen once. It happens, every day. On the date of our wedding, as I gaze upon your gorgeous face, I am reminded of this. May the state in which you have me be eternally known. 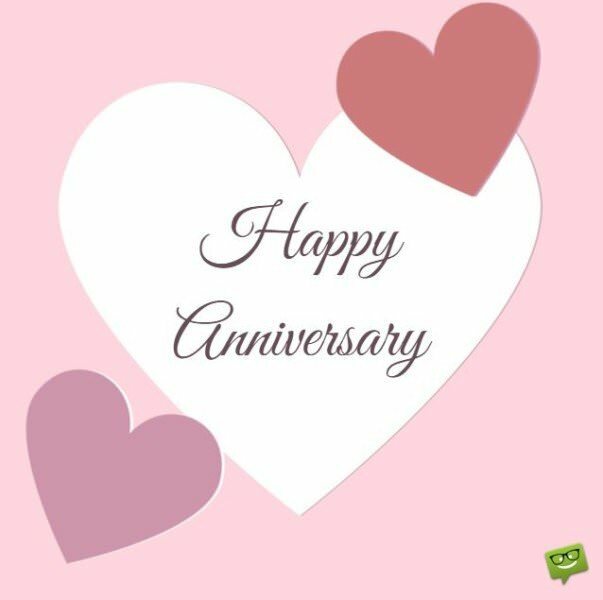 Happy Anniversary, to my husband! The nobility that you carry with you is a revered feature of our marriage! Your selflessness opened my eyes to what is important in this world. On our anniversary, I promise to hold you close and cherish you, because that is what you deserve! Have you seen our Love Quotes? It is an amazing collection of quotes with text on images, to share with your loved one! Happy Anniversary, you make my life complete. When I met you, everything in my life came full circle! You are the woman who made that possible! Happy Anniversary! Happy Anniversary! You are such a wonderful woman, that I have enjoyed the years that we have spent together! Here is to many more years of love and happiness! To my woman, on our anniversary: Marking this date is overwhelming! Your generous nature, and ability to be patient with me fills me with appreciation for you! Thank you for the love you have given me! Today, I get to celebrate the best day of my life, our anniversary! May this day be memorable! May it reaffirm our commitment to one another! Noting the date that my life changed, for the better! Happy Anniversary, sweetheart! You are the reason why my heart is open to new possibilities! Happy Anniversary, on our special occasion! No woman has meant more to me! May you know that I am eternally yours! Happy Anniversary. Every day I love you more. On our special day, my heart overflows with love for you! May you be aware, every day, of how vital you are to my existence! May our anniversary remind you of the way I will always feel about you! Happy Anniversary, to my amazing woman! You are selfless and true to your word! Today, I want you to know that you have improved my life! Wishing the most significant woman I have ever met a very, Happy Anniversary! May we constantly look to the future, together! You are the very definition of femininity! Happy Anniversary to a woman who has a beautiful mind and heart! Cheers to a gorgeous woman! May this anniversary exceed last year’s! I hope that we laugh and enjoy each other’s company, even more! 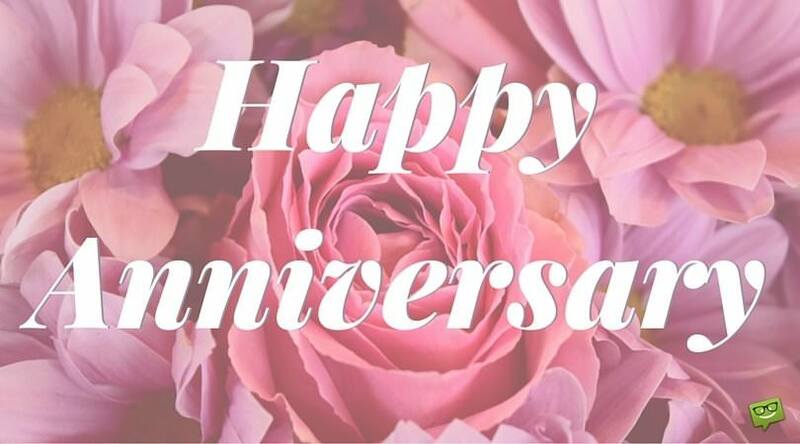 Wishing someone who is grand, a Happy Anniversary! You are a terrific man, and I am greatly honored to be with you! Happy Anniversary, to an exciting man! You have invigorated my life! Now, it is never dull! As I look at you, on our anniversary, I can’t help but think about what a good man that you are! You are brave and kind! You know what you want and you do everything that you can to obtain it! Best wishes, my darling! Wishing the greatest man that I know a very, Happy Anniversary! My life is rich with love, because of you! 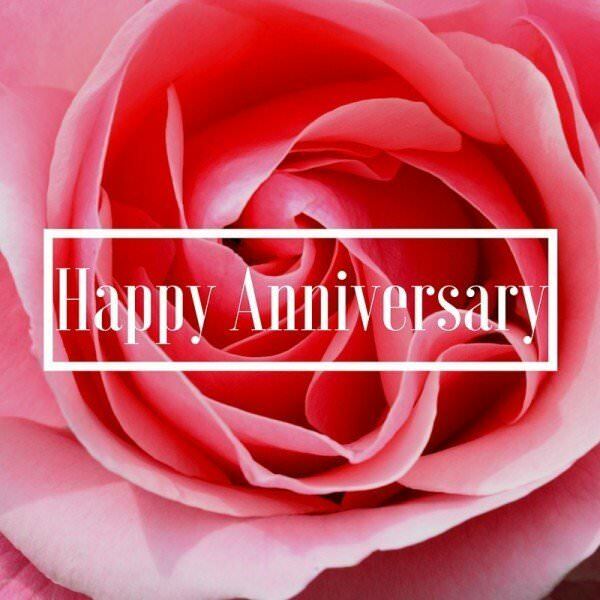 With a grateful heart, I wish the person that I love the most a Happy Anniversary! You are the most intelligent man that I have ever met! I always look forward to being with and talking to you! May we have numerous more moments together! Commemorating the day that we decided to be together, forever! Happy Anniversary, to my love! You are a magnificent man! Happy Anniversary to my, unique man! Your perspective on important matters has provided us with intelligent topics of conversation! The depth that you add to our relationship makes it whole! Happy Anniversary! You are a man who has taught me not to give up on love! When I wasn’t looking for someone, when I was certain that I would continue to be alone, I met you! Thank you for proving me wrong, and giving me years of bliss! Best wishes to the man I love, on our anniversary! You are the most brave and supportive man that I have ever known! You are a true partner and a real inspiration! You have the rare qualities of being both manly and having a gentle soul! On our anniversary, my greatest desire is that you know how one of a kind you are to me, and that all that makes you who you are incites me to love you more! Today, I celebrate our anniversary on the arm of a man who carries himself with dignity and integrity! I am proud to be with you! Cheers to my man! 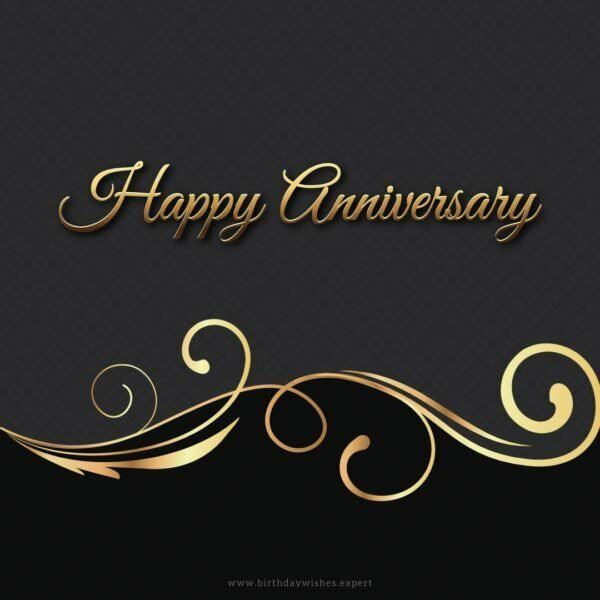 As our anniversary commences, know that you will continue to hold a special place with me! I am thankful to be celebrating another year with you! Happy Anniversary to my beloved, man! I cherish every moment that we spend with each other! As we mark another year together, I would like to express the depth of my emotions for you. You are an impeccable man! I can not believe how lucky I am to have you! May there be no doubt as to the way I feel about you! Happy Anniversary to my loving wife! The day we became one, was the beginning of a new and glorious adventure! You have made my life exciting! Wishing my gorgeous wife a very, Happy Anniversary! You are beautiful, inside and out, and you have brought love and hope to me! Today, know that everything in my heart is with you! Happy Anniversary, wife! Thoughts of our wedding day cause me to feel jubilant! Being loved by a good woman makes the sun shine brighter! Happy Anniversary to my beloved wife! You are magnificent! You are the most intellectually stimulating woman I have ever met! I never get tired of talking to and being with you! Happy Anniversary, darling! You hold a position in my life that is sacred to me! We have a special relationship that only gets better, with the passing of time! 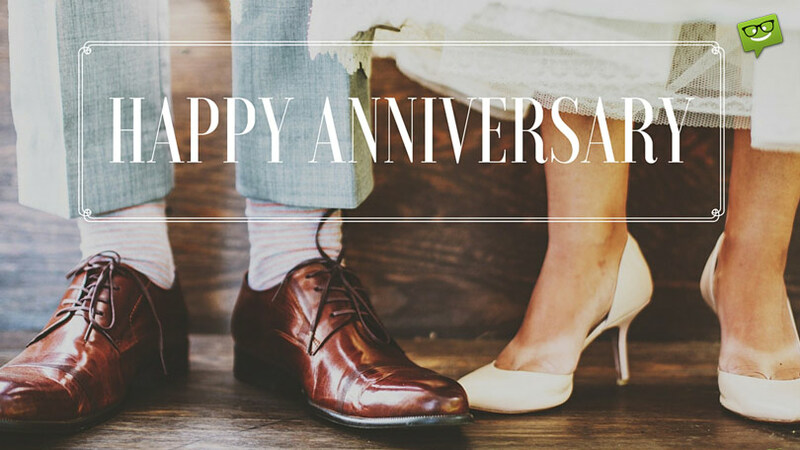 I am looking forward to many commemorating more wedding anniversaries with you! The day has arrived where I get to wish you Happy Anniversary! I will take every chance I get to show you how much you mean to me, dear wife, the ways in which my life has improved, because of you! On the day that we got married, I knew that I made the best decision of my life! You are a terrific wife and mother! Expressing all of the care and thankfulness that I have for you, on our Wedding Anniversary! On this occasion, my wife, may we laugh together, reminding ourselves of how rare it is to find and marry someone who is humorous! Happy Anniversary to the woman who makes me smile! Thinking of our wedding anniversary with the overwhelming elation that I felt on the day that we got married! I love you, dear wife! Wife, our wedding anniversary is an opportunity for me to convey how unbreakable my bond is to you! You are the person I connect with the most! You are the one! Happy Anniversary to the woman who I belong with! Our wedding day was a declaration of how well we fit together and that we can handle any changes in our lives, so long as we had each other. Today, I am proud to know that is true, and very proud to be your husband! You might also want to check out our Love Quotes full of meaning! Happy Anniversary, I love you more than ever. 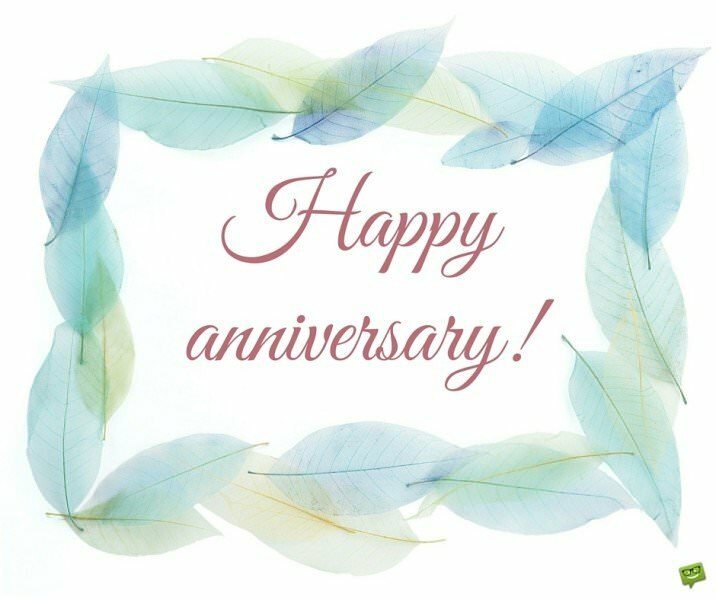 Wishing my dear husband, a Happy Anniversary! You are the strongest, yet kindest man that I have ever known! I am lucky to be your wife! Happy Anniversary, husband! The respect that you give me, and the love and attention that you pay to our children, fills my heart with gratitude for you! Today, we are celebrating the day we became husband and wife! I never would dreamed that I would meet and marry a man who is the epitome of courageousness! Every day, your fearlessness pushes me to be a better person by going after what I want and not letting anything stop me. Happy Anniversary, sweetheart! Husband, you are a dignified and charismatic man! You hold you head up high, because you are aware of your greatness! Becoming your wife was the smartest action I have ever taken! Happy Anniversary! Noting the day that we got married and being reminded of how blessed I am to have a husband like you! You are moral and just! Happy Anniversary to a man of high character! Happy Anniversary, to my fantastic husband! There aren’t enough words to describe how vast my love is for you! Our union has only served to deepen and strengthen what is in my heart! Wishing the man that I married a joyous, Wedding Anniversary! Your compassion and devotion is responsible for the depth of my love for you! You are truly selfless and deserve reciprocation for all that you have given me! Happy Wedding Anniversary! Husband, when there is chaos in my life, your presence calms me, and encourages me to remain focused on what I have to do. You inspire me and my love for you is endless! Happy Anniversary, to the man who leaves me in awe of him! Husband, your giving nature and endless affection for me is astounding! Husband, may the day of our nuptials be grand in our minds! May we rejoice in the knowledge that we are right for each other! Happy 10th Wedding Anniversary! The years we have spent together, so far, have been amazing! You are a terrific person, and I look forward to spend many more years with you! For the past ten years, I have had the honor of being married to you! You are the bravest person that I know! I celebrate this extraordinary day, knowing that I married someone who is truly my soulmate! Happy 10th Wedding Anniversary, to my one and only! Today, I am reminded, even more, of how wonderful you are! You are respectful and noble! When I look at you, I see someone who is self-aware, encouraging, and compassionate! May you know that I cherish and appreciate you, not just on this special day, but every day that we have together! Even after ten years, I still feel the same way about you! You still make me feel deep love and admiration for you! Happy 10th Wedding Anniversary, to my true love! Happy 10th Wedding Anniversary, to the person who I love more than life itself! I have never felt more loved and complete, than I do with you! 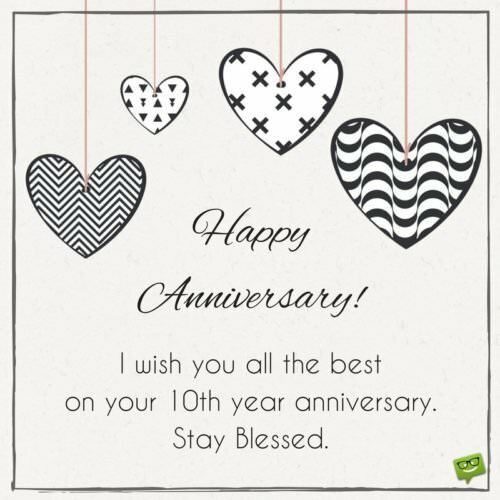 Thank you for making the first ten years of our being together absolutely amazing! Happy 20th Wedding Anniversary! Thank you for continuing to surprise me with romantic gestures! My love for you continues to grow, with each passing year! Cheers to us, on our 20th Wedding Anniversary! Being married for two decades has not diminished the way that we feel about each other! Every day, I am thankful for our solid, true relationship! Happy 20th Wedding Anniversary to my very best friend! You are splendid, in every way! I am grateful to married to someone who I hold in the highest esteem! Happy 20th Wedding Anniversary to the most cherished person in my life! For twenty years, you have made me overwhelmingly happy! I hope that I have always made you feel the same way! May this important date fill you with as much joy as you have given me! Here is to spending twenty, terrific years together! You have given me more peace and love than I ever could have imagined! May you always know the depth of my feelings for you! Happy 20th Wedding Anniversary! Happy 20th Wedding Anniversary, to the most important person in my life! Just thinking about you makes everything better! May our special day be wonderful!